And when they went, I heard the noise of their wings, like the noise of great wars, as the voice of the Almighty, the voice of speech, as the noise of an host: when they stood, they let down their wings. And I saw as the colour of amber, as the appearance of fire round about within it, from the appearance of his loins even upward, and from the appearance of his loins even downward, I saw as it were the appearance of fire, and it had brightness round about. As the appearance of the bow that is in the cloud in the day of rain, so was the appearance of the brightness round about. This was the appearance of the likeness of the glory of the LORD. And when I saw it, I fell upon my face, and I heard a voice of one that spake. The beginning of the third book is described as the climax of the whole work. This is the exposition of the mystical passage of the Chariot found in Ezekiel (cf. Merkavah mysticism). 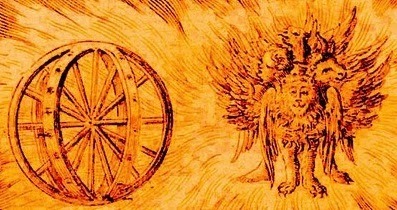 Merkabah/Merkavah mysticism (or Chariot mysticism) is a school of early Jewish mysticism, c. 100 BCE – 1000 CE, centered on visions such as those found in the Book of Ezekiel chapter 1, or in the hekhalot ("palaces") literature, concerning stories of ascents to the heavenly palaces and the Throne of God. The main corpus of the Merkabah literature was composed in Israel in the period 200–700 CE, although later references to the Chariot tradition can also be found in the literature of the Chassidei Ashkenaz in the Middle Ages. A major text in this tradition is the Maaseh Merkabah (Works of the Chariot). Traditionally, Jewish law viewed this passage as extremely sensitive, and in theory, did not allow it to be taught explicitly at all. The only way to learn it properly was if a student had enough knowledge and wisdom to be able to interpret their teacher's hints by themselves, in which case the teacher was allowed to teach them indirectly. In practice, however, the mass of detailed rabbinic writings on this subject often crosses the line from hint to detailed teachings. After justifying this "crossing of the line" from hints to direct instruction, Maimonides explains the basic mystical concepts via the Biblical terms referring to Spheres, elements and Intelligences. In these chapters, however, there is still very little in terms of direct explanation. A brilliant mind facing a text in the heart of mysticism, a truly perplexing description of close encounter with the LORD. As so many others in the past and present, Maimonides could not put his intelligence and knowledge aside with such mighty matters but rather gives a rationalistic exegesis of what Ezekiel's powerful vision of chariots means in scientific terms. "Maimonides endeavors to show that evil has no positive existence, but is a privation of a certain capacity and does not proceed from God; when, therefore, evils are mentioned in Scripture as sent by God, the Scriptural expressions must be explained allegorically. Indeed, says Maimonides, all existing evils, with the exception of some which have their origin in the laws of production and destruction and which are rather an expression of God's mercy, since by them the species are perpetuated, are created by men themselves." Maimonides prefers a smooth Philosopher's God over the very personal and dangerous God of Israel we know from nature, the Bible and history. Maimonides then explains his views on the reasons for the 613 mitzvot, the 613 laws contained within the five books of Moses. Maimonides divides these laws into 14 sections - the same as in his Mishneh Torah. However, he departs from traditional Rabbinic explanations in favour of a more physical/pragmatic approach. Having culminated with the commandments, Maimonides concludes the work with the notion of the perfect and harmonious life, founded on the correct worship of God. The possession of a correct philosophy underlying Judaism (as outlined in the Guide) is seen as being an essential aspect in true wisdom. The purpose of the divine commands in Pentateuch is for Maimonides to have perfect and harmonious life. By following the mitzvot a person worships God in the correct way. The fact that strong rationalism and idealistic moralism are inseparable among the followers of Abrahamic religions, Judaism, Christianity and Islam. The brilliant mind and heart of Maimonides is not an exception to this marriage that appears to make so much sense!. In particular, the adversaries of Maimonides' Mishneh Torah declared war against the "Guide." His views concerning angels, prophecy, and miracles — and especially his assertion that he would have had no difficulty in reconciling the biblical account of the creation with the doctrine of the eternity of the universe, had the Aristotelian proofs for it been conclusive — provoked the indignation of his coreligionists.